As competition increases in nearly every industry, it has become more important than ever for sales professionals to be at the top of their game. This has created an obsession with enhancing productivity and reaching peak performance levels every day. However, productivity is far from a one-size-fits-all concept. In the following pages, you’ll get a glimpse at the productivity habits of some of the leading thought leaders in the sales industry. Maybe you’ll adopt Mark Hunters habit of laying out your objectives for the week every Saturday, or Deborah Sweeney’s daily practice of meditation to help her stay focused. 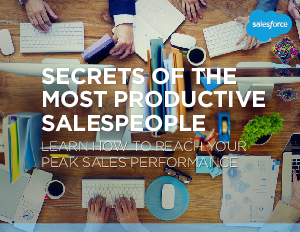 Try some of the ideas in this e-book for yourself and find a routine that keeps you at peak sales performance!